﻿ John 3:5 Jesus answered, "Truly, truly, I say to you, unless one is born of water and the Spirit he cannot enter into the kingdom of God. Jesus answered, "Truly, truly, I say to you, unless one is born of water and the Spirit he cannot enter into the kingdom of God. 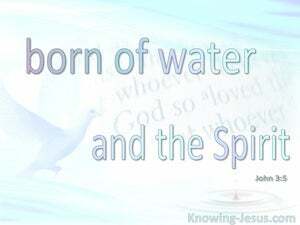 Jesus answered, "I assure you: Unless someone is born of water and the Spirit, he cannot enter the kingdom of God. Jesus answered, "Truly, I tell you emphatically, unless a person is born of water and Spirit he cannot enter the kingdom of God. Jesus answered, Truly, truly, I say to thee, If any man is not begotten from water and Spirit, he cannot enter into the kingdom of God. Jesus answered, Verily, verily, I say unto thee, Except one be born of water and the Spirit, he cannot enter into the kingdom of God! Jesus answered, I assure you, most solemnly I tell you, unless a man is born of water and [ even] the Spirit, he cannot [ever] enter the kingdom of God. Jesus answered him, "Truly, truly, I tell you, a person cannot enter the kingdom of God unless he is born out of water and the Holy Spirit. Jesus answered: Verily, verily I say to you, unless a man be born of water and of the Spirit, he can not enter into the kingdom of God. Jesus said in answer, Truly, I say to you, If a man's birth is not from water and from the Spirit, it is not possible for him to go into the kingdom of God. Jesus answered, "Truly, truly, I say to you, unless one is born of water and the Spirit, he cannot enter the kingdom of God. Jesus answered, I tell thee, except a man be renewed by the spiritual baptism, he cannot enter into the kingdom of God. Jesus answered, Verily, verily, I say unto thee, Except any one be born of water and of Spirit, he cannot enter into the kingdom of God. Jesus responded, Truly, truly, I say unto thee, Unless any one may be born of water and Spirit, he is not able to enter into the kingdom of the heavens. Jesus answered, "I tell you, if a man does not owe his birth to water and spirit, he cannot get into the Kingdom of God. Jesus answered, Verily, verily I say unto thee, Except a man be born of water and the Spirit, he cannot enter into the kingdom of God. Jesus answered, Verily, verily, I say unto thee, Unless a man is born of water and of the Spirit, he cannot enter into the kingdom of God. Jesus says to him, Truly, truly, I say to thee, Except any one be born of water and of the Spirit, he cannot come into the kingdom of God. 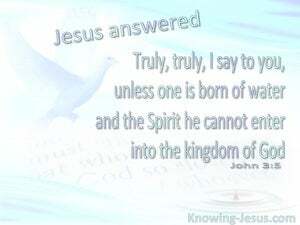 Jesus answered, Verily, verily, I say unto you, Except a man be born of water and of the Spirit, he cannot enter into the kingdom of God. Jesus answered, "Truly, truly I say to you, unless someone is born of water and spirit, he is not able to enter into the kingdom of God. Jesus answered, Truly, truly, I say to you, Unless a man is born of water and the Spirit, he cannot enter into the kingdom of God. Jesus answered, "Verily, verily I say unto thee: Except that a man be born of water, and of the spirit, he cannot enter into the kingdom of God. Jesus replied, "Truly, truly I tell you, unless one is born of water and the Spirit, he cannot enter God's Realm. "I tell you solemnly," Jesus answered, "that unless a man is born of water and the Spirit, he cannot enter the kingdom of God. Jesus answered, "I tell you the solemn truth, unless a person is born of water and spirit, he cannot enter the kingdom of God. Jesus answered, "Truly, truly, I tell you, unless one is born of water and Spirit he cannot enter into the Kingdom of God. Jesus answered, Truly, truly do I say to thee, Unless a man be born of water and of the Spirit, he cannot enter the kingdom of heaven. Jesus answered, I tell you most truly, unless a man is born of water and of the Spirit, he cannot enter into the kingdom of God. Jesus answered - Verily, verily, I say unto thee: Except one be born of water and spirit, he cannot enter into the kingdom of God. Jesus replied, Verily, verily, I say unto thee, Except a man be born of water and the Spirit, he cannot enter into the kingdom of God. "In truth I tell you," answered Jesus, "unless a man owes his birth to Water and Spirit, he cannot enter the Kingdom of God. Jesus answered, Verily, verily, I say to thee, Except a man be born of water, and of the Spirit, he cannot enter into the kingdom of God. "In most solemn truth I tell you," replied Jesus, "that unless a man is born of water and the Spirit, he cannot enter the Kingdom of God. Jesus answered, "I most solemnly say to you, no one can ever get into the kingdom of God, unless he is born of water and the Spirit. Jesus answered, "Most certainly I tell you, unless one is born of water and spirit, he can't enter into the Kingdom of God! Jesus answered, "Verily, verily, I say to you, unless one be born of water and of the Spirit, he cannot enter into the Kingdom of God. Jesus answered, I tell thee of a truth, Unless a man be born of water and of the Spirit, he cannot enter into the kingdom of God. 4 Nicodemus said to Him, "How can a man be born when he is old? He cannot enter a second time into his mother's womb and be born, can he?" 5 Jesus answered, "Truly, truly, I say to you, unless one is born of water and the Spirit he cannot enter into the kingdom of God. 6 "That which is born of the flesh is flesh, and that which is born of the Spirit is spirit. Peter said to them, "Repent, and each of you be baptized in the name of Jesus Christ for the forgiveness of your sins; and you will receive the gift of the Holy Spirit. "Then I will sprinkle clean water on you, and you will be clean; I will cleanse you from all your filthiness and from all your idols. "He who has believed and has been baptized shall be saved; but he who has disbelieved shall be condemned. Jesus answered and said to him, "Truly, truly, I say to you, unless one is born again he cannot see the kingdom of God." This is the One who came by water and blood, Jesus Christ; not with the water only, but with the water and with the blood It is the Spirit who testifies, because the Spirit is the truth. "I tell you, no, but unless you repent, you will all likewise perish. "For I say to you that unless your righteousness surpasses that of the scribes and Pharisees, you will not enter the kingdom of heaven. "I tell you, no, but unless you repent, you will all likewise perish." "Strive to enter through the narrow door; for many, I tell you, will seek to enter and will not be able. For neither is circumcision anything, nor uncircumcision, but a new creation. according to the foreknowledge of God the Father, by the sanctifying work of the Spirit, to obey Jesus Christ and be sprinkled with His blood: May grace and peace be yours in the fullest measure. If you know that He is righteous, you know that everyone also who practices righteousness is born of Him. Whoever believes that Jesus is the Christ is born of God, and whoever loves the Father loves the child born of Him.